It has been said that America is the land of possibilities. Walt Disney, Thomas Edison, Howard Hughes, Samuel Morse and Jonas Salk all demonstrated this through the lives they lived. 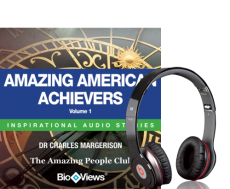 This great audio collection from The Amazing People Club explores the lives of these five iconic individuals who all made very different but equally amazing contributions. You will hear from Walt Disney and learn what inspired the creation of his famous animated films and Disneyland. Howard Hughes will take you on a journey from the oil fields in Texas to the Las Vegas strip. Thomas Edison will share his rags-to-riches story and can inspire you in your own life and career. Each story comes to life through BioViews®. BioViews® are short biographical stories, similar to interviews. These unique stories provide an easy way of learning about amazing people who made major contributions and changed our world.